Offering you a complete choice of products which include fruit bleach cream, diamond bleach cream and gold bleach cream. 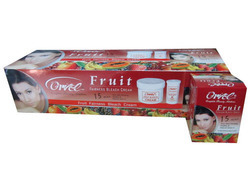 We offer Fruit Bleach Cream, which is used to treat fairness of the skin in a healthy manner. These cream find its extensive application to provide a prominent glow to the skin. Further, our bleach cream is enriched with effective ingredients which add glow to the bleached skin. A unique bleach cream that blends facial hair, cleanse pores, removes impurities and fades facial blemishes from deep within making your skin glow for longer period of time. 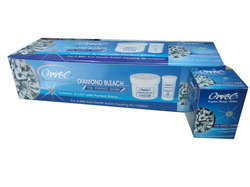 We offer Diamond Bleach Cream that is a blend of fruit extracts specially formulated for the use of all skin type. Its unique non-irritant bleach cream easily bleaches the hair till the roots and leaves behind beautiful skin. Moreover, our range of cream find its extensive application to provide a prominent glow to the skin. Further, this bleach cream enriched witch aloe vera juice, turmeric extract provides excellent moisturizing to the bleached skin. Give the radiance of gold to your skin with our range of Gold Bleach Cream. Our cream promises matchless fairness for the skin in a healthy way. Bleach cream gold penetrate into your skin & nourishes it with water & lipids deep within. Further, the cream have precious gold extracts that give a prominent glow to the skin. 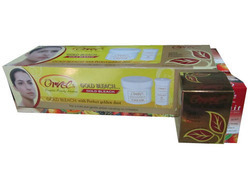 Furthermore, our gold bleach cream is highly appreciated in the markets for being a safe bleaching product for the skin. Looking for Bleach Cream ?